We ran 42 miles today and anchored with some difficulty in on the Roaring River just off the Cumberland near Gainesboro, TN. The bottom is soft and the Danforth anchor wouldn'’t hold. The windlass was stuck so we had to manually lower the plow anchor with its all chain rode. I am sure it will sink a way down into the mud and be hard to pull up tomorrow. Andrew is towing the RIB to the boat ramp here and we will use it to cover the remaining 33 miles to Celina. We will then return to Defeated Creek Marina for an Elvis Presley concert. Hopefully, we will be back there by 7:00PM. 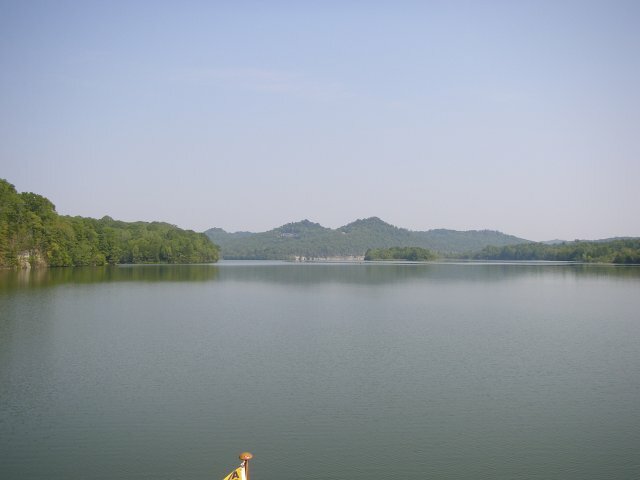 This part of the Cumberland is spectacular with high tree covered hills, islands, and wide expanses of water. There are very few houses or farms. It is a shame it is so far by boat. The temperature reached 104 once again today, but it is nice and cool inside with the generator running the air conditioning. Verizon Internet service is working at this location with just one or two bars.